Adolf Busch (Adolf Georg Wilhelm Busch) was a German violinist, composer, and teacher born on August 8, 1891 (Stravinsky was 9 years old.) 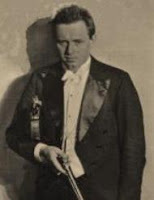 He began violin lessons at age 3 and studied – from age 11 - with Willy Hess at the Cologne Conservatory. Busch also studied composition with his future father-in-law (Hugo Gruters) in Bonn, where he used to sit in on the Joachim Quartet’s rehearsals. In 1912, Busch founded his first quartet, which floundered when the First World War overtook it. After the war, in 1918, he founded the famous Busch Quartet, which played almost continuously until 1951. Apart from this, Busch is remembered for having been one of Yehudi Menuhin’s teachers, though he also taught Erica Morini, among others. In 1927, he moved to Switzerland and from there, in 1939, he moved to Vermont. In the middle of all this, the Busch Quartet had become the core of the Busch Chamber Players, another group Busch founded, and the forerunner of today’s ubiquitous chamber orchestras. In Vermont, he eventually founded (with his son-in-law, Rudolf Serkin, and Marcel Moyse) the Marlboro Music School and Marlboro Music Festival (1951.) During his career, Busch kept concertizing as a soloist, solidifying his reputation as a great Beethoven and Brahms interpreter. Rudolf Serkin often served as his recital accompanist. Though Busch recorded extensively with the quartet, few studio recordings exist of him as a solo player. Live recordings of his performances can be found on YouTube – sound only. It is said that Max Reger (whom he knew since 1907) greatly influenced his composition style. Among his many compositions are a violin concerto, a Quintet for saxophone and string quartet, and a Concerto for Orchestra (1929, fourteen years before Bela Bartok wrote his concerto for orchestra in 1943.) Adolf Busch died on June 9, 1952, at age 61.